Ever since we had our first glimpse of of The Dark Knight himself on the cover Empire Magazine, fans began speculating as to just what ind of new weapon is Batman holding. Thanks to some new toys, we have an answer! The weapon is an "EMP blaster", capable of shooting electromagnetic pulse that will disable most electronic devices within its range. It 'll be interesting to see how Batman uses it in The Dark Knight Rises and most importantly who or what is he aiming it to. There are quick shots of Batman with the device in the trailers, including trailer #3 which came out earlier this week. 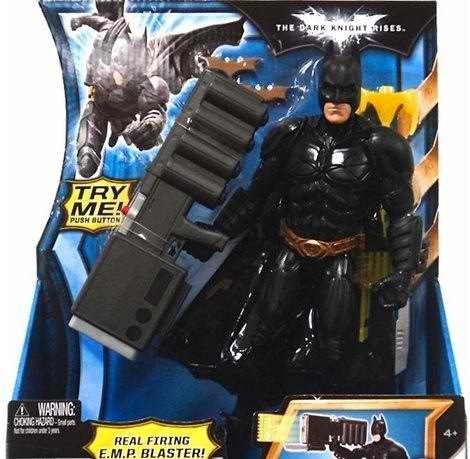 You can see the toy after the jump and let us know how you think Batman will use this new weapon of his by commenting below.